Created on Dec. 21, 2012, 6:53 p.m. by Hevok & updated by Hevok on May 2, 2013, 4:57 p.m. The blood exchange rate is 16 µl/h or 0.66% blood volume [Gibney et al. 2011; 21503883]. The "transdifferentiation" of circulating hematopoietic cells and/or their progeny is an extremely rare event, if it occurs at all. Transplantation of a single green fluorescent protein (GFP)-marked hematopoeitic stem cells into lethally irradiated nontransgenic recipients robustly reconstitutes the peripheral blood leukoctes, but does not contribute to appreciably to nonhetmatopoietic tissues, including brain, kidney, gut, liver, and muscle. Similar in GFP+:GFP-nonhematopoietic cells . Young and old as well as the respective controls can be paired. Heterochronic Parabiosis has been studied in context of aging with regard on the effect on the Immune System, Neurogenesis and muscle stem cells. The thymus weight, T-cell subpopulations in the spleen and proliferative response to PHA of splenocytes after 3 months of partner coexisting were examined [Rejuvenation Re. 2012 -15 (2) - P.239-248; 22533440]. The long-term replenishment of old parabiotic partner in heterochronic pair by young blood, lymphocytes, and stem cells does not induce rejuvenation of the old immune system. The long-term replenishment of yound heterochronic parabiont by old blood and lymphocytes induce age-related changes in the young immune system. Heterochonic parabiosis indicates that the benefits of young immune system, e.g. actively working thymus and regular migration of young hematorpoietic stem cells between parabiotic partners, appears unable to restore the immune system of the old partner. However, there is a progressive immune impairment in the young heterochronic partners . The age-related manifestation in the young partners observed 3 weeks after the surgery is a dramatic increase of CD8+44+ cells population in the spleen. A progressive decline of most immunological functions is observable for up to 3 months after the surgery. This data suggests the existence of certain factors in the old organsims that trigger aging, thus preventing the rejuvenation process . The reseaon for this observation may either be an induction for the existence of induced aging or the temperorary disturbance of the immune system functions in young partners. The period of coexistence in heterochonic parabiosis may affect the life expactancy. Therefore the survival curves for CBA/Ca parabiotic mice after disconncetion was examined. Old heterochronic and isochronic mice lived approximetely the sane 13 and 15 months and young isochronic lived the longst with 27 months, while Y-heterochronic have an intermediate lifespan. The age-related changes in the immune system of young heterochronic partners may lead to the real lifespan decrase. Old blood contains factors that can induce aging of a young organism, which is in good accordance with [Wyss-Corray, 2011; 21886162]. The decline in neurogenesis and cognetive impairments observed during aging can be in part attributed to changes in blood-borne factors. Agign results in the central nervous system in a precipitous decline in adult neural/progenitor cells and neurogensis, with concomitant impairments in cognetive functions. Such impairments can be ameliorated through systemic perturbations like exercise. Heterochronic parabiosisi indicates that blood-borne factors present in the systemic milieu can inhibit or promote adult neurogenesis in an age-depenent fashion in mice. Exposing a young mouse to an old environment or to plasma form old mice decreases synaptic plasticity, and impairs contextual fear conditioning and spatial learning and memory. The plasma levels of specific chemokines including CCL11 (eotaxin) correlate with reduced neurogenesis in heterochronic parabionts and aged mice. The levels of defined chemokines increase in the plasma and cerebrosinal floid of healthy aging humans. Increasing peripheral CCL11 chemokine levels in vivo in young mice decreases adult neurogenesis and impairs learning and memory . The older the mouse, the fewer new nerve cells its brain was generating in the hippocampus. 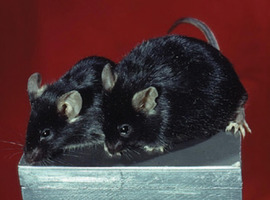 Sharing blood with a younger mouse seems to rejuvenate older partners' brains. Young partners of old/young pairs generated fewer brain cells than unpaired young mice do, and old young/old mouse partners generate more (three fold increase) [http://stanmed.stanford.edu/2011fall/article9.html]. The age-related decline in muscle progintor cell activity can be modulated by systemic factors that change with age. Heterochronic parabioses restores the activition of Notch signaling as well as the proliferation and regenerative capacity of aged satellite cells. The exposure of satellite cells from old mice to young serum enhances the expression of the Notch ligand (Delta), increased Notch activation, and enhanced proliferation in vitro. Heterochronic parabiosis increases aged hepatocyte proliferation and restores the cEBP-alpha complex levels seen in young animals . Villeda SA, Luo J, Mosher KI, Zou B, Britschgi M, Bieri G, Stan TM, Fainberg N, Ding Z, Eggel A, Lucin KM, Czirr E, Park JS, Couillard-Després S, Aigner L, Li G, Peskind ER, Kaye JA, Quinn JF, Galasko DR, Xie XS, Rando TA, Wyss-Coray T (2011) The ageing systemic milieu negatively regulates neurogenesis and cognitive function. Nature 477: 90-4. Conboy IM, Conboy MJ, Wagers AJ, Girma ER, Weissman IL, Rando TA (2005) Rejuvenation of aged progenitor cells by exposure to a young systemic environment. Nature 433: 760-4.